Audiopixelcollider is the College of Fine Arts' VJ Battle, a live performance hosted by MC Dan Caffrey featuring DJ Shadowsweat and Madcoins. Visual artists and lighting designers will showcase their video jockeying and busking kills as they respond to mixed student-produced music, culminating in a unique and immersive experience. A thrilling combination of projection design, film editing, real-time graphics and music, this show is a seamless flow of sights and sounds generated by the College of Fine Arts student communities, including featured performances by José Martinez, Millie Heckler and Dance Action. 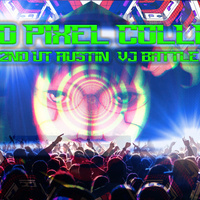 Doors open at 7:00 p.m. at the B. Iden Payne Theatre and the event begins at 7:30 p.m. Audopixelcollider is approximately 90 minutes. Access through the Green Room (Win 1.108). This event is a collaboration between the departments of Projection, Lighting and Interactivity (PLAI), Digital Visualization, and Theatre and Dance. Admission is free; space is limited and reservations are recommended. Unclaimed reserved seats will be released to walk-up patrons beginning at 7:20 p.m. A limited number of spaces will be available for guests without reservations. Participants will compete in teams within a tournament bracket until a winning team is determined. Veejays and Lighting Designers are paired in advance but will have to perform to a randomly selected track of student-produced music. The University requires all faculty, staff, students and visitors to pay for parking on campus. Visitors are encouraged to park in the San Jacinto Garage and Manor Garage, both within walking distance of the theatres. In addition, there is metered parking available on Dean Keeton/26th Street. For those attending select performances at the B. Iden Payne, Oscar G. Brockett and Lab Theatres, discounted parking can be purchased online at https://utcofaparking.clickandpark.com/venue. For Theatre and Dance events, select College of Fine Arts/Texas Performing Arts via Click and Park. Discount parking is available for purchase until 10:00 p.m. the day prior to the event. I was so excited to attend with my kids who are teens. Between the traffic, the logistics of parking and the weather we were not able to make it back to the city. Bummer.